The Lantern review the soundtrack of the off-Broadway musical, Be More Chill. 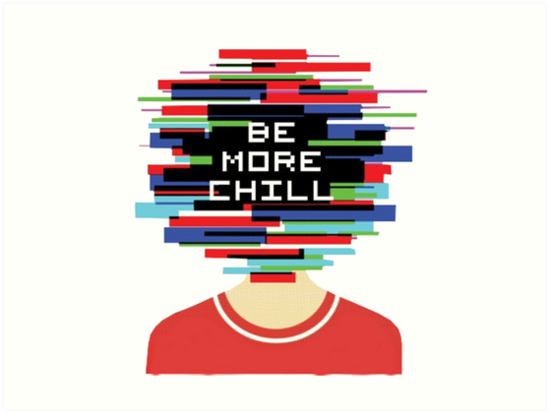 Cover art of the musical, Be More Chill. ‘Take a chill pill’ is often used as advice to lighten the mood, however the majority of the time people don’t mean it literally. The off-broadway production Be More Chill, takes the advice to heart. Because I am not quite dedicated enough to fly to New York and actually watch the production, I have had to make do with summaries from various sites and an astounding soundtrack. Jeremy, a high schooler, is the definition of an outcast and spends the entirety of the musical trying to… be more chill. Like any great musical, there is obviously a love interest that seems to drive him to be more popular. Kristine, the lucky lady, is surprisingly the most dramatic theater kid anyone will ever come across which adds a comical tone to my all time favorite song “I Love Play Rehearsal”. Unlike many other comedic musical shows, Be More Chill has a moral to the story that isn’t the generic overview of how high school is rough and just be yourself. “I liked how they didn’t focus on just the perfect parts of growing up” states musical enthusiast, Katie Allen. Jeremy’s best friend, Michael, performs an incredibly emotional song that conveys the social anxiety that he feels at a party in the middle of a breakdown. The many subplots with supporting characters in the different musical numbers, give depth to individuals. For example, Jeremy’s dad appears without pants on in multiple scenes because he doesn’t care about appearance. This segways into the subplot of him never being there for Jeremy which develops into “The Pants Song” in which shows that ‘if you love somebody you put your pants on for them’. Musicals are typically associated with Wicked or Hamilton. The aforementioned shows are iconic musicals but the music often is more classical and instrumental breaks have little variety. Be More Chill has a mixture of rock with alternative and modern pop. Nathan VanZuilen, a musical novice, commented that “it’s a fun and quirky musical that is a great on to listen to if you’re just starting off in musicals.” The style of music is very refreshing and evokes the targeted emotions throughout the duration of the track. Grace Yarbrough claims the music has “electronic influences and really cool video game vibes.” The composers have created their own genre of music in a sense. As Jeremy progresses through his journey, the music gives the audience a connection to him and one could sympathize even during the most insane plot twists. Soundtracks are generally difficult to follow the first time through, however the individual songs are so catchy that I’m not even mad. My first time listening to the track, I was completely lost and immediately thought it was the weirdest way I could have spent my time. Fortunately, “Michael in the Bathroom” has an earworm effect and I eventually fell in love with the entirety of the soundtrack as well as the characters. The arbitrary twist to ordinary high school life hyperbolizes real scenarios that happen everyday and yet doesn’t feel cliche. Be More Chill shakes up musical stereotypes yet preserves the connection to reality.